Sculpture: Sculptures can be created using different kinds of materials like paper, clay, wood, stone etc and are available in many different shapes and sizes. Some sculptures are small as rice grains and others much bigger than the skyscrapers. 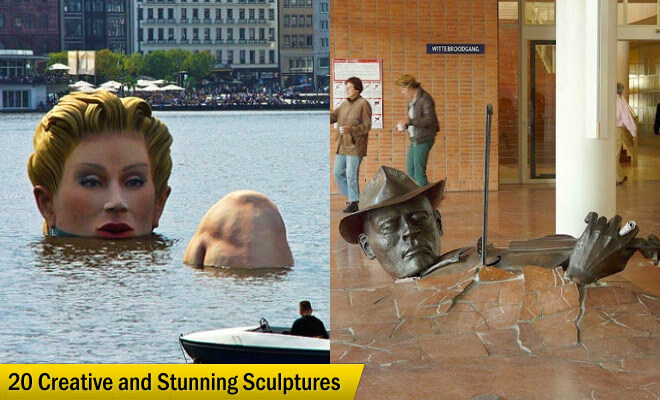 In this post we have included 20 Stunning Sculpture works from around the world for your inspiration. We have scoured the internet and present the most stunning and sculptures which will make you say, “Are they for real?”. Each of these sculptures have their own story to tell. For eg: The sculptures of shoes on the Danube Bank(Budapest, Hungary), tells the story of the victims who were asked to remove their shoes before being shot down near the sea during world war 2.